ESPN's panel of experts have chimed in on the AL West. 9 out of 19 isn't too shabby! Almost a coin toss among the ESPN crew. None of the 10 experts that picked the Angels have the Mariners slated to win the wild card, sticking with conventional wisdom that only one team from the west will advance. One vote for Bedard for Cy Young. Top reserve bat: Juan Rivera (.310/23/85 in '06), who may get the nod on opening day due to an ankle injury to Matthews. If he played for Seattle, Rivera would be one of the Mariners' top 3 or 4 hitters. Assuming Ichiro is better than Figgins, and the backend players are comparable, the real difference in the lineups is LAA putting up Vlad/Anderson/Hunter every day vs the M's Ibanez/Beltre/Sexson (or Wilkerson). Tough to imagine the two teams have nearly identical payrolls. LAA will shell out $109 million this year, while the M's payroll is around $106 million. Pitching is where the M's invested this offseason, and only injuries to LAA's top two starters (Lackey & Escobar) give them the edge. But the more the rotations are examined, this could be a significant edge. 1. Jered Weaver: Can he bounce back from a disappointing 2007? I think he will be a solid #2 this year. But there is always the chance that neither Weaver will live up to their hype. 2. Jon Garland: This deal looks GREAT for the Angels now. Losing Orlando Cabrera hurt, but they would be in big trouble without Garland holding down the #2 slot. The trouble is he isn't much more than a #3 starter on a good team. Maybe a #4. 3. Ervin Santana: Followed up an encouraging 2006 campaign with a 5.76 ERA and 1.55 WHIP in 2007. The Angels round out their rotation with two replacements for their injured big guns. 4. 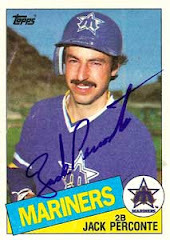 Joe Saunders: 3 year avg: 4.47 ERA, 1.48 WHIP. Silva's 3 year average is 4.49 ERA, 1.34. Look for the Mariners to give Saunders a $50 million. 4 year deal in the off season. 5. Dustin Moseley: Moseley was 4-3 with a 4.40 ERA in 46 appearances, including eight starts, for the Angels last year in his first full big-league season. Minor league numbers are not terribly impressive. Kelvim Escobar is likely done for the year. John Lackey has a strained tricep and won't throw at all for the next 3 weeks. Return is tentatively slated for early May. 1. Eric Bedard: My favorite quote from Eric Bedard this spring is this gem after his last spring tuneup start: "I didn't have a plan. I just went out there and threw strikes." I guess he's not a big believer in "practice like you play." My 5th grade basketball coach would be appalled. Should we be concerned? Bedard had a 6.06 ERA and a 1.53 WHIP in April last year, with the league hitting .291 against him. Expect a mediocre April and a great season. 2. Felix: The waiting is the hardest part. 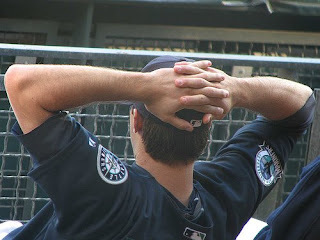 It's not now or never, but if not now, you have to wonder if he will ever emerge as a #1 starter in an M's uniform. 3. Silva: See: Joe Saunders, with upside. 5. Batista: Has his moments, but nothing to get excited about. So when it comes down to it, the M's rotation is 2 high ceiling guys, and 3 others who are all just about identical. Any one could have a good year, but it is more likely that each has a month or two that are above average, and the rest nothing to write home about. The good news for Mariner fans is they have a proven track record and piece together a better rotation than what LAA is putting on the hill. 2. Lackey doesn't pitch effectively or is out until the All Star Break. 3. Anaheim's bullpen struggles early in the absence of Scott Sheilds. Speaking of Shields, the Angels' setup man is slated to only miss a week. Make that a month and now we have something. 4. No young pitchers step up to fill the voids in the backend of the LAA rotation. 5. Significant offensive injury. Vlad, Anderson, Hunter...one of those guys, or at least Figgins, need to miss significant time. All of these are possible. But none matter if Sexson, Beltre, Ibanez, and the rest of the Mariner hitters don't step up. Disaster has already struck the LAA rotation. Now it just needs to spread to the rest of the team. And the M's need to sign Barry Bonds. So the M's have reportedly shut down Brandon Morrow for a few days due to what they're calling a "tired shoulder". Shocker. They take a kid, overwork him in the bullpen as a rookie, send him to winter ball to turn him into a starter, and now he's back as a setup guy firing mostly fastballs all spring. He hasn't stopped throwing for a year. I'm tired for his shoulder.